Connie was so excited about graduation that she could nearly smell the ink on her certificate. After spending years planning for college, she was so excited to be accepted into her first-choice school. But three days before graduation, Connie was hit by a drunk driver. They both lived through it, but Connie’s injuries were extensive. She needed several surgeries, and she’d have to spend a year relearning how to walk. Connie was crushed. She couldn’t understand how God could allow this to happen. She’d been certain she was headed to the right school. She wrestled with her feelings while she forced herself to go through the rehabilitation program. When Connie finally made it to college, she was delighted. The milestone was that much sweeter than it would have been before. While she was in her freshman year, Connie met Lee, and they fell in love. But Lee was in the military and was transferred not long after freshman year. They continued to date long-distance, and Lee eventually proposed to her. Connie is thankful now for that year of delays. If it hadn’t been for the accident, she wouldn’t have met Lee or had the chance to start a family with him. Sometimes, God allows detours into our lives. 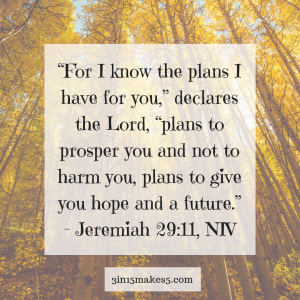 He does this because He’s working on a special plan for your life. Lord, thank you for the detours in my journey. I don’t always understand them, but I know You. You’re a good Father, and I can trust You every step of the way. In Jesus’ name, Amen.